Phone Check and Test is designed to quickly check your Android phone or tablet. 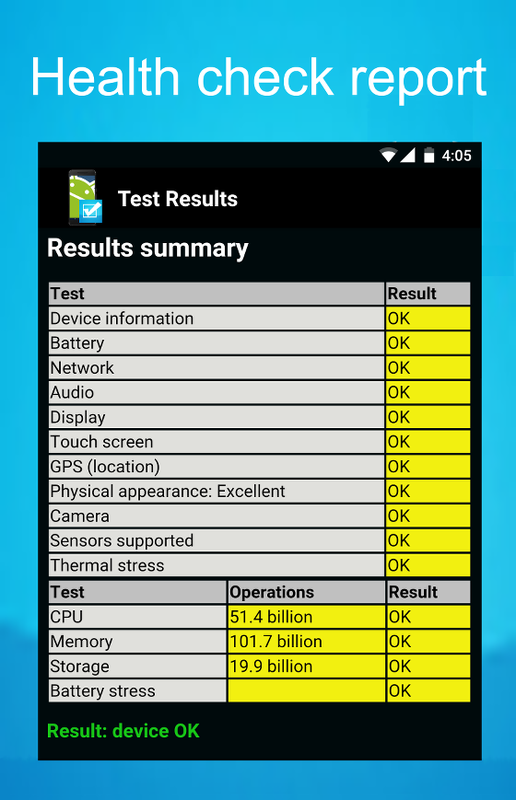 Get an Android device health check now with this phonecheck software. MONITOR, TEST, REPORT: Phone Check and Test allows you to monitor your devices key device usage and signal strengths, provides an easy to use guided process to quickly check and test all of the main components of your phone or tablet and displays a phone information report which can be emailed. The tests are configurable and are run as a series of tests and checks. Among the many tests are a GPS test and a WiFi test. Test your phone … before you rely on it daily. Phone Check and Test is especially useful if you have just purchased an Android phone, are selling a used phone, had your cell phone repaired, dropped your phone or it just seems to not be working as well as it should be. Identify problems so you can return your phone or have the problem fixed now (within the warranty period) and before you start relying on your phone for your daily activities. Check if there is a hardware problem or other type of problem that can be resolved, without buying a new phone. Next: Android phone testing details.